My college car, which also happened to be my first car, was a 1997 Honda Accord LX automatic. It was the first vehicle I ever bought, and though I had enjoyed it towards the end of my ownership, I was not initially a big fan of it. During the summer between my freshman and sophomore years of college, I took up a summer job, but had no car to use to make the commute. My parents agreed to take me car shopping as this was Southern California, after all. After doing weeks of research, I settled on a 1991 Acura Legend coupe with the five speed manual transmission. The car just had a brand new engine and suspension components installed, so at least I could be sure the engine and suspension were good. After showing my parents my research, the decided to ignore me and take me to a shady used car dealership in Alhambra, claiming that, "Chinese dealerships would get me the best deal." I was screwed. Needless to say, I did not end up with the Legend. Instead, a 1997 Honda Accord LX was foisted upon me, to my dismay. The stock 1997 Honda Accord LX came with the non-VTEC version of the F22B series engine (F22B2 if I remember correctly). It made 130 hp and 139 lb./ft. Considering that I had learned to drive in my family's 2002 Acura 3.2 TL, the Accord felt incredibly anemic. I figured that if I had to live with the car for a couple of years, the least I could do was make it more interesting for myself. Over the course of the next three months, I added an AEM Cold Air Intake, DC Sports 4-2-1 two piece ceramic headers, and a GReddy SP2 exhaust to the car. Admittedly, the power gained from the breathing improvements could not be really felt unless I pushed the car hard, but the extra noise generated by these parts made it feel like a rush. During my junior year, the rear of the car would bounce uncontrollably when I drove over a speed bump or pot hole. I eventually figured out that the rear shocks had begun to leak and started looking for replacements. This is when I learned that OEM Honda parts were ridiculously expensive, and opted to buy a completely new aftermarket shock and suspension kit. I ended up with a set of Tokico HP blue shocks and lowering springs that cost roughly the same as purchasing two OEM Honda shocks. This was probably the first modification that I made to the car that was truly satisfying. Sure, the car rode pretty rough with the aftermarket suspension, but it handled like a champ...almost. The skinny, stock wheels and tires were an issue, but I could not justify buying a new set of wheels and tires while the tires that came with the car were still in good condition. 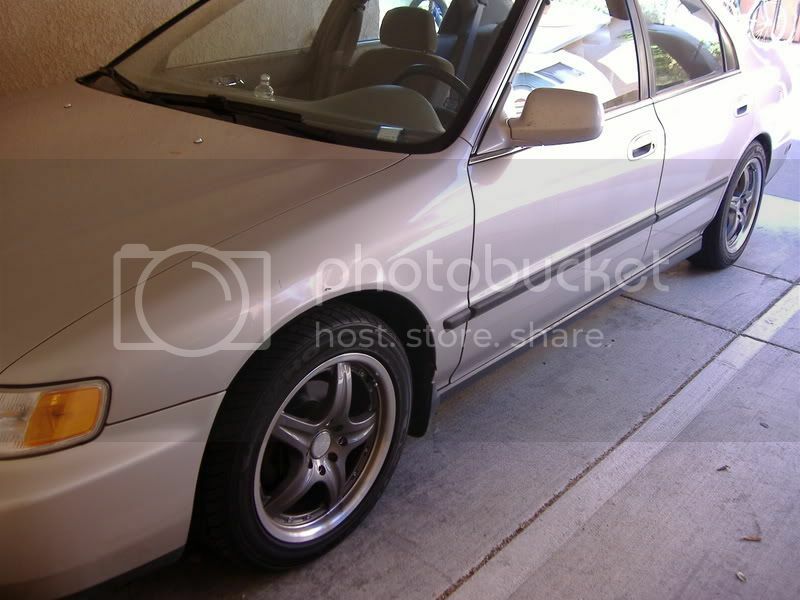 Luckily, over the summer between my junior and senior year, I noticed the tires on my Accord were going bald. Having taken up a temporary job at my family's business, I earned enough money to purchase a set of ICW Kobe 16x7 wheels and a set of Kuhmo Ecsta AST 205/45/16 tires on my car. This was the last modification I made to my car and completed what I thought was necessary to make my car more fun to drive. Over the course of my ownership of this car, I went on quite a few trips, met my current girlfriend, drove the car multiple times between Northern and Southern California, and first started to learning how to maintain a car by myself. I had a lot of good memories with my '97 Accord, despite how much I disliked it in the beginning. When I was done with school and learned I could not take the car back with me to Southern California, due to not having anywhere to park it, I was able to keep the car around by selling the car to my girlfriend, who would be moving to Southern California to attend graduate school. It was not until a couple years later when my girlfriend and I decided to replace her car with something more reliable that the car ended up in the hands of a stranger. That day made me sad as I would likely never see the car ever again. As for the surprise, well surprises, I experienced while modifying the car, I learned that the previous owner of the car apparently had no idea how to properly maintain the vehicle. The shop I took my car to for the modifications showed me corrosion in both the exhaust header and exhaust that should not have been there. Guess it goes to show that just because someone "looks like a nice guy," does not mean they know how to take care of their car. In many ways, the experience that my brother had with his college car purchase came about as a result of my ownership experience with cars in college. My first car, which I purchased shortly after returning home from my freshman year, was the quintessential rice-rocket of the era - the 1997 Acura Integra LS coupe. Sporting Honda's brilliant little B18 motor with 140 hp and 127 lb-ft of torque mated to an excellent 5-speed manual transmission and pulling a svelte 2643 lbs of car, the Integra was the perfect car for a college student. The hatchback body style made it useful for carting people and gear to and from school and with it regularly producing 25 mpg, it was frugal and easy on the wallet. It took some convincing to get my parents to acquiesce to allow me to purchase it in the first place, but when they finally gave in, I was ecstatic. Of course, the fact that it was "Arrest Me" red and fitted with sporty 17-inch Team Dynamics wheels made it a hard sell, but since I was spending my own money, I was eventually able to get my way. Unfortunately, within a couple of weeks of owning the car, the first bought of bad luck struck and a crazy woman looking to skirt traffic hit the front fender and bumper of my car as I was entering a left turn lane. Luckily, the damage was entirely cosmetic, but I should have taken that as a sign. Shortly after getting the car back from the repairs, I suffered a sports related injury that resulted in a broken ankle and was out of commission for several months, unable to enjoy my new toy. When I finally recovered and was able to drive my car again, I made sure to take advantage of every last minute. Having the good fortune to attend school within spitting distance of the Angeles National Forest, I discovered the wonder that was Glendora Mountain Road and nearly every free moment, found reason to take the car out to have a little fun. Unfortunately, this would eventually result in the demise of the Integra as one night during the winter of my junior year, I was driving the car in the mountains late at night, with temperatures creeping down into the mid-20s, and came across a patch of black ice mid-corner while pushing pretty hard. The end result was a collision with the side of the mountain, spinning several times and coming to rest a mere 5-feet or so from the edge of a rather steep cliff. Smelling like the explosive charge from the airbag, I was able to hitch-hike a ride down the mountain. When I attempted to return the next morning to collect the pieces, I found that the local Sheriff's department had already collected the broken remains of my car and transported it to a local salvage yard. Insurance was called, adjusters made appearances, and eventually, a check was written. Luckily, the insurance company decided the car was worth more than the pay-off on the loan and so I made out okay, in the end. Unfortunately, given the timing, it meant that I would not have a car for the remainder of the spring semester. However, I did still need a car as I frequently traveled back and forth between school and home, so I began my search for a replacement. At this time, Acura was in the process of introducing the TSX to the US market. I immediately was struck by the sleek design was and the photos had me smitten with the interior. A few phone calls and email exchanges with dealers later, I had worked out a great deal on one of the first handful of 2004 TSX sedans to hit the streets. Swaddled in the leather sport seats, hands on the steering wheel, driving one of the best handling sedans that Acura had introduced to date, the Integra became a distant memory. The only aspect of the car that felt lacking was that I settled for the automatic transmission instead of insisting on the wonderful 6-speed manual. This car would remain with me until I relocated to the East Coast and I got to enjoy it for many seasons. At one point, I even pulled the ECU and sent it to Hondata to be reflashed, making the car ever more tractable and more enjoyable to drive. While the car was nearly flawless in meeting my needs, my desire for a manual transmission would eventually get the better of me and I ended up swapping my 2004 TSX for a revised 2006 model with a few more features and Acura's sweet 6-speed manual. At the end of the day, what we drove in college has had an impact on our cars that have succeeded them. West Brother has continued his trend of modifying cars, with his current S2000 now sporting Enkei RPF1 wheels and going for a more sporty appearance. East Brother, on the other hand, has been gone through a succession of factory stock cars that have largely been modified in nearly invisible ways to make a practical car more enjoyable to drive. Either way, we both have a life-long love of cars that has been fostered over the years by our wallets. The cars we drove in college revealed more about our preferences and served as a further foundation for what we will likely drive well into the future. Share with us what you drove in college and how you think it impacted your vehicle choices you made in your life.